J-Novel Club has added a new light novel series to its lineup: Clockwork Planet, by Yuu Kamiya and Tsubaki Himana (with art by Sino). So far there are four volumes in Japan for this series, which is published by Kodansha Light Novel Bunko (Kodansha). There is an anime adaptation currently airing, which you can watch streaming on Crunchyroll. One of the authors for the light novels, Yuu Kamiya, is best-known for writing and illustrating No Game No Life. Clockwork Planet‘s illustrator, Sino, is also known for illustrating light novels Sunday Without God and Lance ‘N Masques. Worth noting is that this is J-Novel Club’s first license of a title that isn’t from Overlap or HJ Bunko. Kodansha is one of the bigger publishers of light novels, so there are a lot of interesting possibilities for titles that may be translated into English one day. 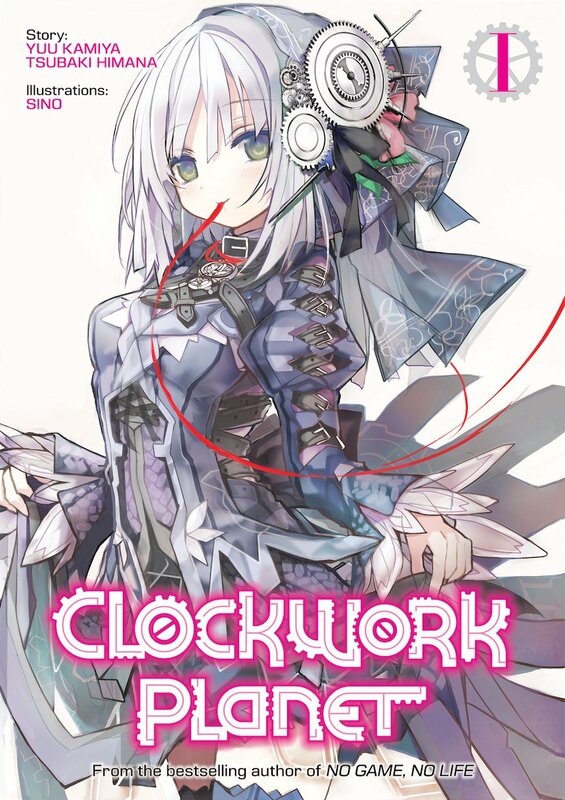 You can read the first part of Clockwork Planet volume 1 on J-Novel Club’s website for free right now! –I know this is sudden, but the world had already collapsed long ago. Earth had died, but the entire planet was reconstructed and reproduced using clockwork – “The Clockwork Planet.” One day, a black box suddenly crashed into the house of Naoto Miura, a high school failure, from above. Inside was– an automata girl. “For me to be forced to sleep for as long as two hundred years from just one little fault, has the intelligence of humanity still yet to exceed even that of a flea?” A gearhead fantasy meshed together by Yuu Kamiya and Tsubaki Himana!